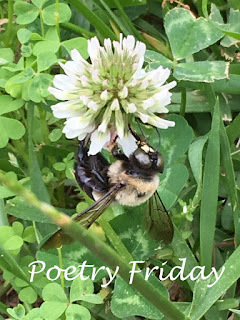 Welcome, June and Poetry Friday, hosted by Buffy Silverman at Buffy's Blog! Thanks, Buffy, for our welcome to a summer month! Memories from the senses appear without invitation. Watching the grand-girls climbing a tree perches me in my own tree in a grandparents' backyard where I spent summer days reading after dragging an old pillow up to a limb. A grandpa mows along with me as I push my little mower, listening to its whirr, whirr, whirr. There is no sound I know like it. This poem arrived from a taste, a summer afternoon treat at a grandparents' home where I visited each summer through most of my growing-up years. That taste of Pepsi let the words pour! Let me be transformed, if only for a while. I drink my Pepsi and become a little girl again. one icy glass under the elm. waits for the evening cool. and I turn the pages with a clip, flip. satisfied that nothing has changed. Isn't it amazing how something like the taste of Pepsi can bring back memories? Love the phrase "spare room of stories." And your last stanza is gorgeous. Thanks, Buffy, my time there was idyllic, holds so many good memories. And yes, one taste, one smell, one sound and back one goes. I love your last stanza Linda, it feels so safe and secure as if summer is wrapping warm sunshine around the little girl. Thanks for this rich summer snapshot, captured in time! You're welcome, Michelle. That time was a favorite part of my childhood, brought back every summer it seems. The swing, sit, sip, clip, flip, settle, sigh....all bring me right there. I feel like I am with you. But those words lost son and feed me stars.....that adds quite another layer of emotion and depth. This is a perfect Memorial Day reflection. When did you write it? Thanks, Linda. I've written similar poems about this time with those grandparents, but mostly written other memories in prose. This time, I put parts into the poem. This is lovely, Linda. Tangible details that conjure a sweet memory. What rich and specific memories. Lucky you to have had these times with your grandparents. Yes, I did feel lucky to have continued to have that part of my family in my life. Thanks, Mary Lee. Love that memory, Kimberly. Whether we agree with the "thing" or not, like that magazine, I'm sure when you see it, you see your Aunt Helen. Thanks for sharing. Isn't it funny what tastes and sounds can bring back? The smell of lilies of the valley always makes me think of my grandmother, who grew them in her yard. Thanks for the reminder! Yes, it works and it is a wonderful thing, JoAnn. I have lilies of the valley, too, but no real memories except now I know that my daughter loves them, so that's a new one. Thanks! What a lovely poem, Linda -- you've captured the memories of your summer childhood so beautifully. I love that feeling of safety and all is right with the world you expressed so well being in your grandparents'home (how wonderful to have a spare room of stories). Thank you, Jama. They had a huge home and that spare bedroom upstairs was like a big closet & filled with magazines like the Post and one comfy sofa! I grew up thinking Pepsi was a rural thing. Don't know if it's true, but remains a memory for me. My aunt, a farm wife, drank it, too. Thanks, Bridget. My grandmother drank Tab. The taste and the fizz in my nose remind me of her. Do they even make Tab anymore? Thanks for the memory. I'm not sure about Tab, maybe? I'm glad you know what I mean about taste. The memory doesn't fade. Thanks, Margaret. This poem paints such a marvelous multi-sensory picture, Linda, from the taste of the Pepsi and touch of the icy glass to the smell of the newsprint, etc. Thanks for sharing it with us, and for stopping by at our TeachingAuthors blog today, too. Happy June to you, too! Thanks, Carmela, those senses connect always, don't they? I was glad to read your post today, all those connections! You made me verklempt, Linda. I remember opening a bottle of ice cold Coke and hearing the fizz and living the effervescence. Love it, makes me smile! Thanks, Diane! Oh, Linda, how I love that last sentence! I love how it was such a serene place for you. How they must have loved you and yearned that their son could have watched you grow up.! Thanks, Ramona. As I grew older, they did talk about my father more, and that was nice. Now I wish I could go back and ask more! Such special memories. Makes me wish I had a close relationship with my grandparents. I love "The afternoon pauses,/waits for the evening cool." That's exactly the feeling your poem gives me. And that last stanza... ahhh. Thanks, Michelle. I was close to my maternal grandparents, too, and these summer weeks were special. A lovely memory, so peaceful and sweet. The magic is in the details. They fed you stars. What a gorgeous poem, Linda - your writing is just sparkling these days. This took me right back to my grandmother's house down a dusty road in Arkansas - summer visits where we'd walk to the little store to fetch something cold from the big, white, rounded cooler in the back. Pretty sure there was a Dr. Pepper sign hanging up somewhere, though I've never been a fan - but other kinds of colas, yes! Thanks, Robyn. This was special to write. I love hearing your memory, too, those dusty roads! You made me smile about that big cooler. I remember those well. When I took my students to Mexico, they saw them, most for the first time. And had to learn how to use the bottle cap remover on the corner! Much fun! Such lovely memories you've spun into a gorgeous poem from just a sip of Pepsi. That ending is simply beautiful--I love that the fed you biscuits and stars and Pepsi. Thanks, Kay. Each of those three are discrete memories. Maybe I need another couple of poems? The elm caught me - remembering back to hot afternoons of picnics in the backyard sitting under the elm, next to the two old apple trees. Hardly an elm survived. But what a grand tree! Wonderful memories with just the right words to wrap it. Thanks, Myra and Donna. Somehow I missed these because we no longer get notified about comments. I appreciate that you enjoyed the poem. Yes, the elms were a sad loss, I agree, Donna.